The music of the Charleston area is a diverse and eclectic mix, sure to please the ears of all looking for some great tunes. Live performances are abundant in the area at small and large venues as well as a variety of special events. Located under a 3-story house jacked up in the air in Charleston’s historically diverse East End. Here you will find delicious food, great conversation, friendly spirits and live original music from all over the planet. An outdoor concert series presented by the City of Charleston, WV. The concerts take place each Friday from Memorial Day Weekend to Labor Day Weekend. For over 30 years “Mountain Stage w/ Larry Groce” has been the home of live music on public radio. Founded in 1983 in Charleston, WV and is produced by West Virginia Public Radio the show travels but most are recorded at the WV State Capitol Complex. Free Lunchtime Concerts in Davis Park the third Wednesday of the month from May until September. The concerts last from 11:30am to 1:30pm. Fret ‘n Fiddle offers new and used string instruments. Specializing in vintage instruments, including guitars, mandolins, banjos and fiddles. They also offer consigned merchandise and a recording studio. In addition to an open mic night and scheduled performances, they have a broad selection of books, wide variety of hard-to-find magazines and unique collection of cards and gifts as well as an Art Annex. Charleston’s newest record store! They specialize in vinyl, with thousands of new & used records in stock, as well as tons of CD’s, DVD’s, and more. The West Virginia Symphony Orchestra presents classical, pops, family & chamber-music concerts annually. The WVSO also provides affordable, high-quality concerts, collaborations with arts organizations and a nationally award-winning education program. The WV Music Hall of Fame has a satellite exhibit in the Dickinson Street parking. The display features instruments, photos, posters and vintage memorabilia from Mountain Stage musicians – with an emphasis on those from the Kanawha Valley. The Vandalia Gathering brings together the finest traditional Appalachian musicians for a weekend of great picking. Elder statesmen and young upstarts perform on stage, compete in contests and play in impromptu jam sessions all over the Capitol Complex. Visitors to the Gathering can enjoy fiddle, banjo, mandolin and guitar contests outside during the day, and concerts in the State Theater in the evenings. Food and craft vendors are also part of the festival. Free day of music with the WV Symphony Orchestra and other musicians on the lawn of the University of Charleston. Artisan tents and food vendors are also present throughout the day. The day ends with the Symphony playing and fireworks. Part of FestivAll, Charleston’s Fund for the Arts produces this day long concert and lawn party. 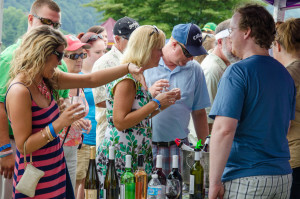 West Virginia wineries sell glasses and bottles of a variety of wines, jazz musicians take the stage and attendees enjoy the lawn of the University of Charleston. Summer is a music lover’s paradise in the Charleston area. With a large variety of outdoor concerts and events, there’s always an opportunity to enjoy the sweet sounds of summer in Charlie West.